I have had a number of people tell me that they can’t download my pictures off Flickr, because they are “protected”. You can download the pictures, but I have had so many people confused about this I figured I would explain it in detail. Flickr automatically sets all photos to copyright all rights reserved, I make a habit of leaving all pictures with people in them on that setting, so pictures of my friends and family can not be used by other websites. I also make a habit of changing most other pictures to creative commons, so those pictures can be used by other websites. This is how I have gotten my pictures on sites like wired.com and mainstreet.com. Either way, all rights reserved or creative commons you can download pictures and here is how. 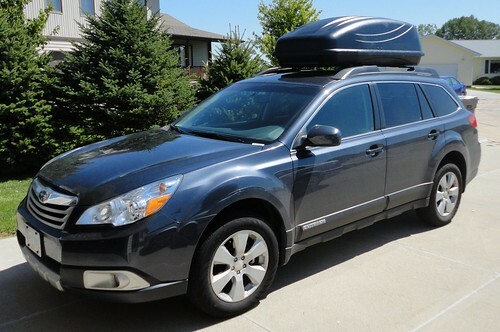 I decided we needed a cargo carrier for the Outback, not that the Outback doesn’t have enough space, it has plenty, I just wanted one. My thought was it would make it easier to haul “baby stuff” for weekend trips, along with luggage, Gordie, and of course Elena…well, Gordie and Elena would go in the Outback, not the cargo carrier, but you know what I mean. I also had a trailer hitch installed, now we can haul the whole family and a place to stay…we have become “Those People”.